ALBANY, N.Y. — A national consumer group warned Tuesday that some back-to-school products may contain dangerous chemicals. The U.S. Public Interest Research Group sent 27 school supplies it purchased to an independent laboratory to test for chemicals of concern. Most were found to be safe, it said. "(But) the presence of toxic hazards in school supplies highlights the need for constant vigilance on the part of government agencies and the public to ensure that school supplies containing toxic chemicals are removed from store shelves," said the nonprofit, founded in 1971. Asbestos in Playskool crayons sold at Dollar Tree. Asbestos can cause lung cancer and mesothelioma. Phthalates in Jot brand blue 3-ring binder, also sold at Dollar Tree. The Consumer Product Safety Commission has deemed their levels of phthalates, which can cause birth defects and other health problems, unsafe for children. Benzene in Board Dudes brand markers, sold on Amazon. The chemical is a known carcinogen linked to various health problems, including immune deficiency. Dollar Tree disputed the findings. "The safety of our customers and associates is our top priority," the company said in a statement. "Our company utilizes a very stringent and independent testing program to ensure our supplier products meet or exceed all safety and legal standards. "We are aware of the report and have since re-verified that each of the listed products successfully passed inspection and testing," Dollar Tree officials said. Hasbro, Playskool's parent company, said it is investigating the report's claims. "Product and children’s safety are top priorities for Hasbro," the company said. "We are conducting a thorough investigation into these claims, including working with Leap Year, the licensee of the product." Most of the products tested were safe. Among them: a 24-pack of Crayola crayons and markers, Cra-Z-Art crayons, and Up & Up crayons; as well as Jot markers, college notebook and plastic rulers. Four different glues were all deemed safe, including ones sold by Playskool and Elmer's. So, too, were two lunch boxes, a Thermos Disney Star Wars version and a Disney princess one. Two Thermos water bottles passed their tests, the report said. The New York Public Interest Research Group said the national report offers guidance to parents shopping for the start of school. 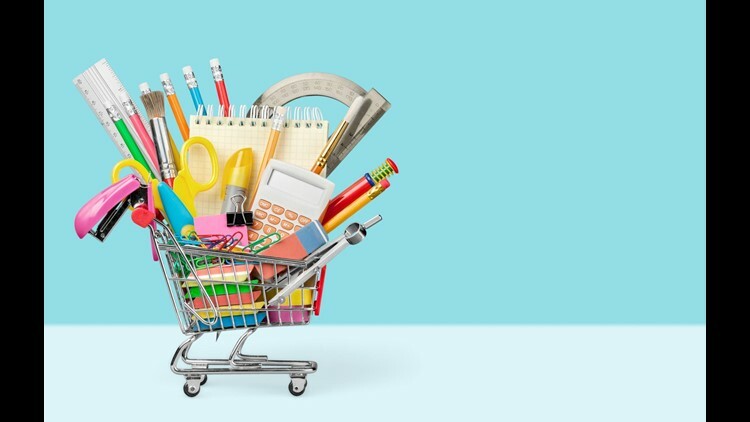 "This fall, parents and teachers can use our safe shopping guide to help them purchase school supplies,” said Russ Haven, the New York group's general counsel. The groups urged the U.S. Consumer Product Safety Commission to conduct more testing of school supplies, and they encouraged parents to stay on top of any recalls by visiting recalls.gov.